ATTENTION: This case/solution applies only when this error was caused by partitioning with older versions of partition software which does not support vista partitioning. Although NTFS, vista partitions are different than XP, and require specific amount of space reserved before the primary partition, so most partition software applications available at this point, do not support Vista. These include: all versions prior Acronis Disk Director Suite 10.0 build 2160, all versions prior and including Norton’s Partition Magic 8.0.. and since these two are the leaders, I shouldn’t even mention others. That’s why Vista has its own built-in tool for resizing partitions now. winload.exe vista The selected entry could not be loaded because the application is missing or corrupt. FIX: These are only the recovery tools from windows vista. 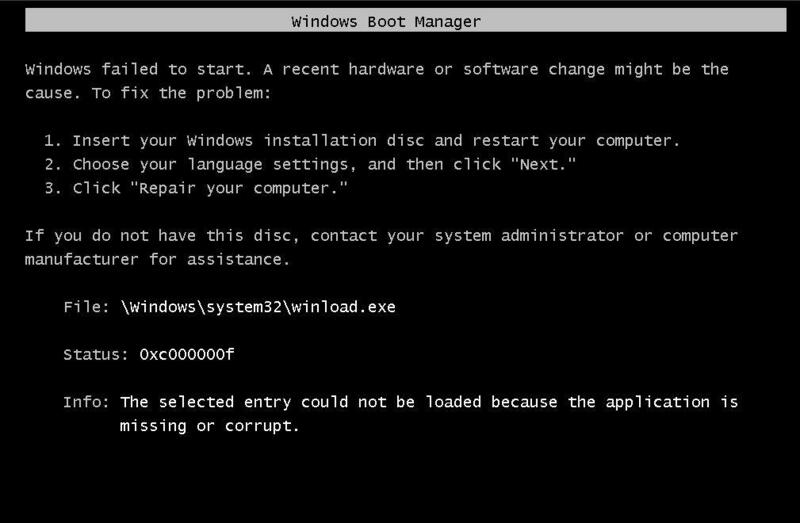 Boot from it(restart the computer, at boot time after the logo is displayed you should press a button which is specific to every PC(usually Del, F2, F10 etc) which should bring you to your BIOS. 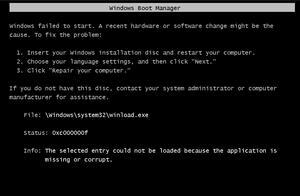 Navigate to the bot menu, and change the priority of boot devices to your CD/DVD Optical Disk. After Vista Recovery CD is loaded choose Repair and it should detect the problem automatically. Something like: “Your windows installation requires repair” will come up to which you answer yes and you are done. If I saved your day, please be kind and elaborate how did you do it exactly for the sake of other winload.exe sufferers. Niceone thanks, it solves alot of mysteries with the Vista partitions, I didnt know that it required empty space at the beginning of the partition in order to create a valid one. This worked perfect!!!! Thanks so much very good answer, and very fast fix! I had the same error come up about winload.exe missing or corrupt, but it has nothing to do with partitions, as no one has done that to the computer. We have ordered a set of recovery disks, hope that fixes the problem since it is not even a 2 year old computer, barely used for only email and word processing. Well i have a problem. Mine is messed up really bad. I booted up Mac os and vista and xp and linx. At the end i figured out to boot it all correct but i accidentally removed my mac version and now the message comes up while i am trying to get into bootloader. I can’t access to bootrec.exe it won’t let me. Any idea on how to help me? Thank you very much. It has solved my booting problem. Very nice work! Thank you so much man, I was starting to get headaches trying to solve this problem. I was even confused at times believing that an actual recovery disk had come with my notebook when I bought it. Anyways, nice work! when the cd is put in. and it does not show you have an operating system, you probably do not have your operating system set as active. Good software to do such is paragon boot cd. it will boot your computer in the worst of conditions. go to harddrive manager and you can right click your hard drive and set it back to active. This site is wonderful. lol its a cheesy slogan at the top. BUT THE CONTENT is great. how can I “under the boot options menu, change the priority of boot devices to yours cd/dved optical disk.” I dont know how to do it can you show me by some picture please? We saw something like this in our corner of Michigan recently. Can’t wait all these XP systems to start needing upgrades. I’m getting the headache with this. I exactly got the same problem. Excellent blog with clear instructions. My Vista Ultimate after a clean install had the winload.exe error message and all attempts using a valid install disk failed. Only after I used the command prompt with your instructions did I success. Keep up the good work!! I followed these steps but the boot disk will not boot. 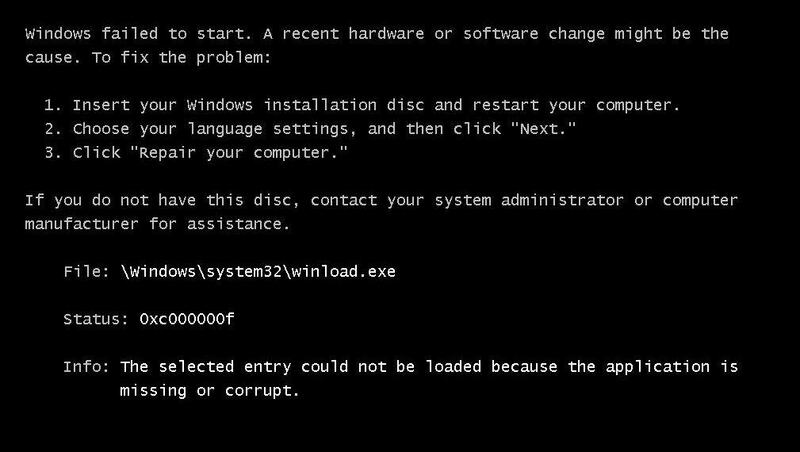 I get the black screen loading files, then the small green bar at the bottom, then it’s a black screen and the disk stops spinning. I changed my boot order to read the cd-rom first (optical disk drive was first before) and that still didn’t help. I’ve got work files on my laptop that I desperately need to get to. I hope someone out there can help me with this. Greatly appreciated! After installing a new bigger harddrive and cloning my Vista-System via Acronis TI 10 I got the above error. hmmm problem still exists. Any other help on this? Thanks a lot for you info above. I had som rundll32 problems and was changing some settings in “windowsconfig” and then I got the same screen as you…. I had no idea that it was possible to download the recoveryd CD but when I found your site everything went well!! I’d bought a recovery program (success guaranteed) which didn’t work. I then found this advice, which I followed with a completely successful outcome. will this work in windows 7? if not, what should i do about it? I have the same error “winload.exe missing or corrupt” but in my case it can’t be because of partitioning because I don’t have any partitions. Do you have any idea what else could be causing this problems because I have been searching the internet for hours and I can’t seem to fix it. I’m getting a little desperate! Wow this really works!! !Just copy the 2 commands 1 by 1 then, restart ur computer and problem solve. This is 1 of 100 websites that solvess this problem!!! Actully only website that has it. Thank U Technoish.com!!! I found that with my mates netbook, the cpu wasnt compatible with the operating system that i was installing for him. He had a cpu built for 32 bit OS and bought a 64 bit edition of windows 7. I got the same error message. Thank You, After much work I managed to clone a drive only to have the error you have listed here. Your fixed worked !!! Just know that it only takes a second and looks like nothing happend but now I have a perfectly working Vista OS. Hello I tried to make this work but when I repaired my system worked but I got another ones account. I can’t make anything of this work and now my computer is more messed up than before. what should I do? I really love your post. Hope this blogpost will help other people. Sorry for the short review. Thank you for your help. The repair disk worked. It was the easiest thing I ever had to do on a PC. Thanks again. Thank god the second link was still on air. You made my weekend a lot easier. Thank you for your help : it solved the “winload.exe corrupted or missing” issue on a vista PC. Awesome! I had a customer come in this week with a failing HDD in his laptop and a replacement drive still in the box. What was a normally simple operation (pull old drive, insert new drive, slow mirror) turned into a nightmare. No manner of ghosting / mirroring / acronis imaging was causing his new drive to be bootable. Vista repair disk said there was nothing wrong, but all I got was a flashing cursor. The ‘bootrec /fixmbr’ and ‘bootrec /fixboot’ saved the day. This customer had so much unusual stuff I was truly dreading a wipe and reload. Any Help would beGreatly appreciated! Trying to install XP Pro -just to get it to boot, says no hard drive! Is there tools on the Vista recovery DVD’s that I can get to without it locking after loading files (boot to comand prompt: ? What to Consider when Buying a Drone? What are the Best Car Dash Cameras on the Market?